I am sharing this because Louis and Omi are dear friends of mine (Omi being actually my girlfriend). While they were visiting us here in late Spring/early Summer, they were supposed to get a regular check-up call from the Department of Social Services. However, Social Services never called, and even though Louis made multiple calls to try to get ahold of them, they were removed from the SNAP program. It is nearly six months later and they still are getting the run-around by their state, so they are having to use food banks in order to have enough food to eat. So, a friend asked me to sum up my experience with using the local food bank. So, first thing to keep in mind. Our food bank is only able to provide service on a once-a-month basis. You tell them how many people you are providing for, and they base how much they give you off of that. In our case, they know we are a family of five. In addition, you should know that the quality of the food is totally random. Sometimes you get name-brand goods, usually off-brand, a lot of the time the super-saver generic. It totally depends on the donations that keep the bank open. Now, I don't know how much the bank pre-sorts out of the donations, but it is painfully obvious that some people use the food bank as a way to clean out their pantries of old, damaged, unused foodstuffs. Even after the pre-sorting, though, it's not all inside the "Best Used/Sold By" dates. Let me start with a list of what was, verifibly still "good" food - that is to say, still inside the date, not open, no signs of being off. :: We got a single package of bologna, a single package of hot dogs, five pounds of AP Flour, eight white hamburger buns, four boxes off-name mac and cheese, a box of spaghetti noodles, 2 single packets of Ramen (chicken flavor,) two boxes of noodles, a small canister of oats (steel cut, pleasant surprise,) six packets of cherry-lime diet drink powder, one bag Pinto Beans, two jars of peanut butter, a can of peas, two cans each of green beans, carrots, tomato sauce, and tomato soup, and a box of bran flakes cereal. There was also a flat of deli-made cupcakes that expired the day we got them. The rest was just plain out of expiration. The "Asian Blend" veggies that had started to rot in the bag were pretty bad. The two loaves of bread weren't growing anything, yet, so they were still edible. The Wheat Thins were out by over a month, but still fine. The ready rice from July.. not so much. The Jiffy mix from February, the box of hot chocolate from May, the PORK and beans can from May, and the black beans.. all out from early this year. The 40 oz can of yams from LAST year.. was pretty gross. There was also a half of a pudding cake that was out by a few weeks - half of that was dry, but the other half was still edible. So, there you have it. 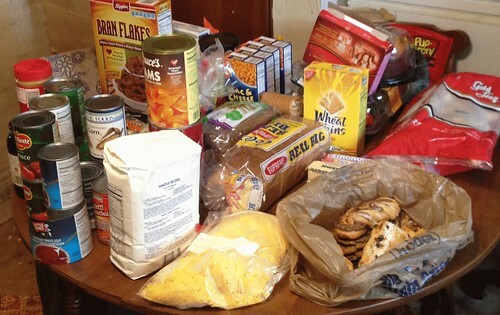 That is what we got, for a month, from the food bank, for a family of five. (They also tossed in 16 oz laundry soap, and a couple other toiletries.) Some months we throw away more than we did, this time, some months a little less. It really depends on our luck of the draw. I hope this write-up is helpful. This entry was originally posted at http://nonny.dreamwidth.org/508109.html. Please comment there using OpenID.